*If you want control buy a remote! ^*A western horse has guts and commitment, an English horse has grace and elegance, but my horse has it all! *Want to end up with a million bucks in the horse business? Start out with five million. *Ride it like you stole it!!! *I’d rather be dumped by a horse than dumped by a man! *To Ride Or Not To Ride?….What A Stupid Question! *If there aren’t any horses in heaven then I’m not going!!! *A Cowgirl and her Horse, both working for affection, Work hard together day in and day out, trying to reach perfection. They love each other as a partner, as a friend, a never dying relationship that in their hearts will never end. They can’t wait each day to greet one another, from day to day they pray. *Talent takes you to the top, but character keeps you there. 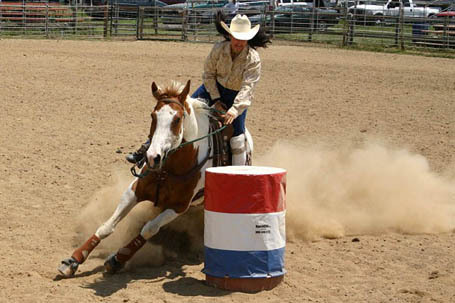 *Relax when you enter the arena, run for that first barrel hard, but run with your horse as one. *Today I will do what you won’t, so that tomorrow I can do what you can’t. *Respect your mount and they will work that much more for you. ^*If you’re not making dust….you’re eating it!! *Do not start with me, you will not win. *The surgeon general never said anything about smoking the competition! *You got to work hard, practice hard, and ride hard, to be hard to beat. *Surgeons General Warning: Horses are expensive, addictive, and may impair the ability to use common sense 99% of a horses problem is from the saddle up! *Always remember that you are unique. Just like everyone else. *God made women so His horses would survive. *Love your neighbor as you love your horse. *cowboys are like horoscopes they always tell ya what to do and are usually wrong. *im at the end of my rope and your tugging on it. * dont stop kickin til the clock stops tickin. * if your horse says no, you either asked the wrong question, or you asked the question wrong. *if you always do what youve always done, you will always get what youve got. * there are no short cuts to any place worth goin. *my horses, my dog, my truck, my trailer… im set for life. *life is to short to worry about the small stuff, leave it in the dust. *you know your a horse person when; your trying to get around someone and instead of saying excuse me you poke them in the ribs and say over. *I love Jesus, my horse and now its between you and the dog….Dog won. *its like nuts and bolts…if the rider is nuts the horse bolts. *to win you have to risk losing. * if your gonna be dumb you have to be tough. * nobody ever lives their life all the way up…except bullfighters. *dont have any regrets in life if you have a dream… go for it. * shut up and cowgirl up. * any curve anywhere anytime…Bring it on. Comments Off on Sayings you need to be a Cowgirl…..